Summer in Maine is hay season, and the opportunity to work the hayfields provided spending cash for young teens. A friend and I worked the Ricker dairy farms in Derby and Milo many times back in the 60’s. Shown here in the photo is part of the tractor pulling the hay baler, and then stacks of hay on a flatbed trailer. Our job was a balancing act on the flatbed catching bales and stacking them, and usually much higher than shown before heading for the barn. Breaktime on a dairy farm was especially enjoyable because the milk was free, and chugging quarts of chocolate milk after a long morning in the fields was a treat. Add sandwiches, Devil Dogs or Twinkies and a piece of fruit, and it was the perfect meal. I was usually down 2 quarts come break time because more often than not, milk at home was powdered milk. Growing up in a family of 8 kids meant cutting some corners, so some folks may not appreciate how something so simple could be so memorable. 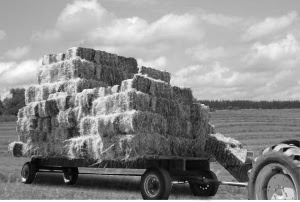 Keep in mind that each trip to the barn meant unloading the same bales onto a conveyer belt and stacking them again inside the upper part of the barn as they dropped off the end. Loading and unloading often continued into the night depending on the weather forecast. The lift home in the back of a pickup provided a welcomed rush of cool air considering the chaff in the drawers and raw forearms from manhandling 75 lb. bales of hay for 12 hours. On one ride home in the back of the farmer’s pickup, my buddy spotted a friend driving towards us, and for whatever reason peeled off half of a leftover peanut butter sandwich and tossed it like a frisbee. He was aiming for the windshield of the oncoming car, and it looked like a good ‘un. He missed because of the air currents, but his flying saucer with peanut butter swept around the side, got sucked in the driver side window, and stuck flat against the inside of the back window. Bullseye! We laughed and waved as truck and car sped off in opposite directions. I doubt each party was equally amused.